Preston suffered their first defeat under manager Phil Brown - a result which leaves North End seven points adrift of safety in the Championship. Garry O'Connor's opening goal came with a touch of fortune after his 23rd minute shot deflected wickedly off Leon Cort and beyond Andy Lonergan's dive. Lonergan made fine stops from Danny Haynes, Frank Nouble and Jacob Mellis. But the keeper's botched clearance let Jacob Butterfield break clear and set up Haynes for an injury-time tap-in. Brown set his stall out with an attacking 4-3-3 formation but Preston rarely threatened Tykes goalkeeper Luke Steele as on-loan Chelsea youngster Mellis dictated proceedings impressively on his debut. Mark Robins' side have now lost only once in their past seven home games and despite Ian Ashbee and Leon Clarke pulling on Preston shirts for the first time, the Tykes commanded the game. O'Connor got the better of Cort in the cruellest circumstances to give his side the lead after a surging run from on-loan Manchester City full-back Kieran Tripper had set up the Barnsley attack. Barnsley could have made it two when Tripper's 64th-minute free-kick found Diego Arismendi unmarked, only for the ball to bounce harmlessly off the Uruguayan midfielder's shins and into Lonergan's arms. Barnsley ended stronger and Haynes sealed the points after Longergan's poor clearance. 95:10 The referee brings the game to a close. 90:00+4:05 Sean St. Ledger fouled by Frank Nouble, the ref awards a free kick. Direct free kick taken by Andy Lonergan. 90:00+3:47 Booking The referee shows Danny Haynes a yellow card. 90:00+2:46 Assist by Jacob Butterfield. 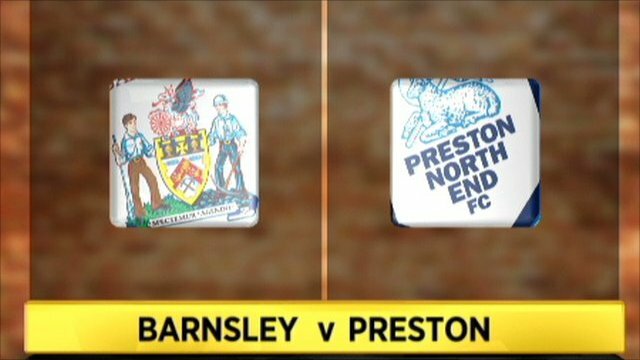 90:00+2:46 GOAL - Danny Haynes:Barnsley 2 - 0 Preston Danny Haynes grabs a goal from inside the penalty area to the top right corner of the goal. Barnsley 2-0 Preston. 89:50 Corner taken by Keith Treacy, clearance by Jason Shackell. 88:27 Corner taken by Keith Treacy, clearance made by Jason Shackell. 87:32 Foul by Jason Shackell on Iain Hume, free kick awarded. Shot on goal comes in from Keith Treacy from the free kick, Luke Steele makes a save. 87:02 Jacob Butterfield takes a shot. Andy Lonergan makes a save. 85:44 Jacob Butterfield delivers the ball, Leon Cort manages to make a clearance. 83:32 Frank Nouble is caught offside. Andy Lonergan takes the direct free kick. 82:58 Nathan Ellington handles the ball and concedes a free kick. Luke Steele restarts play with the free kick. 81:14 Jim O'Brien takes a shot. Save by Andy Lonergan. Free kick awarded for a foul by Nathan Doyle on Keith Treacy. Keith Treacy crosses the ball in from the free kick. 79:04 Substitution Jacob Butterfield on for Jacob Mellis. 77:21 Keith Treacy takes the inswinging corner, save made by Luke Steele. 75:05 Substitution Leon Clarke goes off and Danny Mayor comes on. 74:35 Jacob Mellis decides to take a short corner. 73:16 Nathan Doyle concedes a free kick for a foul on Leon Clarke. Sean St. Ledger takes the free kick. 70:56 The official flags Danny Haynes offside. Andy Lonergan takes the indirect free kick. 68:44 Sean St. Ledger concedes a free kick for a foul on Frank Nouble. Bobby Hassell delivers the ball from the free kick right-footed from right wing. 68:14 Diego Arismendi gives away a free kick for an unfair challenge on Sean St. Ledger. Direct free kick taken by Andy Lonergan. 66:59 Foul by Leon Clarke on Jacob Mellis, free kick awarded. Free kick taken by Bobby Hassell. 66:59 Substitution (Barnsley) makes a substitution, with Jim O'Brien coming on for Garry O'Connor. 66:59 Booking Leon Clarke receives a caution for unsporting behaviour. 64:20 Free kick awarded for a foul by Adam Barton on Jacob Mellis. Kieran Trippier crosses the ball from the free kick right-footed from left channel, Andy Lonergan makes a fantastic save. 63:04 Ian Ashbee has a shot on goal from outside the area which misses right. 61:51 Adam Barton takes a shot. Luke Steele makes a brilliant save. 59:26 Substitution Adam Barton comes on in place of Barry Nicholson. 59:26 Substitution Craig Morgan leaves the field to be replaced by Keith Treacy. 58:36 Craig Morgan concedes a free kick for a foul on Danny Haynes. Free kick crossed right-footed by Kieran Trippier, save by Andy Lonergan. 58:36 Booking Booking for Craig Morgan for unsporting behaviour. 56:22 Free kick awarded for an unfair challenge on Kieran Trippier by Billy Jones. The free kick is delivered right-footed by Bobby Hassell from right wing. 56:22 Booking The referee cautions Billy Jones for unsporting behaviour. 54:54 Unfair challenge on Frank Nouble by Conor McLaughlin results in a free kick. Matthew Hill restarts play with the free kick. 53:26 Sean St. Ledger challenges Frank Nouble unfairly and gives away a free kick. Jacob Mellis crosses the ball, Garry O'Connor takes a shot. Save by Andy Lonergan. 53:26 Booking Booking for Sean St. Ledger for unsporting behaviour. 52:18 Corner taken by Iain Hume played to the near post, clearance made by Kieran Trippier. 50:40 Sean St. Ledger gives away a free kick for an unfair challenge on Jacob Mellis. Free kick taken by Bobby Hassell. 49:20 Free kick awarded for an unfair challenge on Bobby Hassell by Nathan Ellington. Luke Steele restarts play with the free kick. 48:20 Free kick awarded for an unfair challenge on Diego Arismendi by Ian Ashbee. Jason Shackell restarts play with the free kick. 47:24 Unfair challenge on Matthew Hill by Ian Ashbee results in a free kick. Free kick taken by Luke Steele. 45:00+1:17 The ref blows to end the first period. 43:44 Iain Hume has an effort at goal from outside the box missing to the wide left of the goal. 42:58 Sean St. Ledger fouled by Garry O'Connor, the ref awards a free kick. Free kick taken by Andy Lonergan. 42:22 Leon Clarke takes a shot from just outside the penalty area clears the crossbar. 40:34 Danny Haynes produces a volleyed right-footed shot from 18 yards. Save made by Andy Lonergan. 40:08 Corner taken right-footed by Iain Hume, save made by Luke Steele. 38:48 Free kick awarded for an unfair challenge on Bobby Hassell by Leon Clarke. Luke Steele takes the free kick. 36:54 Leon Clarke produces a right-footed shot from just outside the box that misses to the right of the goal. 34:26 Iain Hume takes a shot. Luke Steele makes a brilliant save. 33:32 Iain Hume takes a inswinging corner from the left by-line to the near post, Kieran Trippier manages to make a clearance. 32:48 Foul by Kieran Trippier on Billy Jones, free kick awarded. Free kick crossed right-footed by Iain Hume from left wing, Bobby Hassell makes a clearance. 30:52 The ball is swung over by Danny Haynes, clearance by Sean St. Ledger. 29:40 The assistant referee signals for offside against Danny Haynes. Andy Lonergan takes the free kick. 29:16 Conor McLaughlin concedes a free kick for a foul on Garry O'Connor. Direct free kick taken by Matthew Hill. 28:16 Free kick awarded for an unfair challenge on Barry Nicholson by Jacob Mellis. Andy Lonergan restarts play with the free kick. 26:12 Unfair challenge on Garry O'Connor by Sean St. Ledger results in a free kick. Jacob Mellis restarts play with the free kick. Correction - 25:38 Frank Nouble gives away a free kick for an unfair challenge on Conor McLaughlin. Andy Lonergan takes the free kick. 25:36 Free kick awarded for a foul by Frank Nouble on Conor McLaughlin. Free kick taken by Andy Lonergan. 23:48 Leon Clarke concedes a free kick for a foul on Jason Shackell. Matthew Hill takes the free kick. 21:36 Danny Haynes provided the assist for the goal. 21:36 GOAL - Garry O'Connor:Barnsley 1 - 0 Preston Garry O'Connor grabs a goal from the edge of the area high into the middle of the goal. Barnsley 1-0 Preston. Correction - 19:32 Conor McLaughlin gives away a free kick for an unfair challenge on Garry O'Connor. Free kick crossed right-footed by Jacob Mellis from left wing, clearance by Leon Cort. 19:32 Conor McLaughlin challenges Garry O'Connor unfairly and gives away a free kick. Free kick crossed right-footed by Jacob Mellis from left wing, clearance made by Leon Cort. 16:29 Danny Haynes is flagged offside by the assistant referee. Free kick taken by Andy Lonergan. Correction - 16:28 Danny Haynes is caught offside. Free kick taken by Andy Lonergan. 15:13 Jacob Mellis takes a shot. Save by Andy Lonergan. 14:25 Foul by Nathan Doyle on Nathan Ellington, free kick awarded. Free kick crossed by Conor McLaughlin, clearance by Bobby Hassell. 13:40 Shot by Nathan Ellington from just outside the area goes over the net. 12:45 Billy Jones gives away a free kick for an unfair challenge on Danny Haynes. Jason Shackell takes the direct free kick. Correction - 9:20 Ian Ashbee challenges Nathan Doyle unfairly and gives away a free kick. Free kick taken by Bobby Hassell. 8:34 Billy Jones delivers the ball. 5:24 Leon Clarke is caught offside. Luke Steele takes the free kick. 3:52 Sean St. Ledger challenges Jacob Mellis unfairly and gives away a free kick. The free kick is delivered right-footed by Nathan Doyle from left channel, clearance made by Craig Morgan.